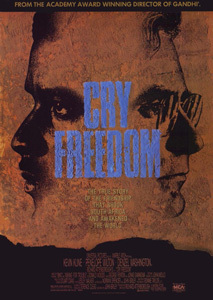 The night before my first visit to South Africa I watched the film Cry Freedom. Maybe not the most reassuring preparation I could have chosen. I was in two minds about the trip anyway after years of running the Amnesty International group at university, boycotting South African apples and pears and refusing to deal with Barclays Bank because of their presence there. On the one hand it felt like supporting a system I disagreed with (it was still under apartheid), on the other I am always keen to experience places first hand and develop my own direct point of view. I went anyway. The first few nights I awoke sweating, terrified by the dreams I was having. A mixture of what I had seen in the film and my own paranoia as I realised that my luggage (this was the 4th country on a 3 month trip) was full of magazines I shouldn’t have, music I shouldn’t be listening to, books that were still banned. I was convinced I was going to be caught and be punished. In a way then it was no great surprise to me what happened on the fourth day. I returned to my hotel room as usual and opened the door. As with most hotels I passed the bathroom on the way into the room and glanced through the open door. For some reason I immediately noticed that my wash-bag had gone from beside the basin. No matter, I thought, I must have taken it back into the main part of the room. A fraction of a second later my heart stopped. The room was empty. Absolutely everything was gone. The room had been stripped bare. Now my heart was in my mouth. The secret police must have taken everything for investigation. Terrible things would happen to me for my views. Luckily my sensible self stepped in at this point. Observing that there was a total absence of men in uniform ready to cart me away, I forced myself to consider that there might be a more sensible explanation. My sensible self took me by the hand and led me back to to the elevator and back to reception to make a relaxed enquiry about WHAT ON EARTH HAPPENED TO MY ROOM. No, relaxed! Try again. It turned out the water boiler in the room above mine had burst and flooded my room. The fact that all the furniture had also gone might have given me a clue on this but I suppose I wasn’t at my most logical in the moment. I was moved to a another room, and the rest of the uneasy week proceeded. On the last day we had to present our findings to the board. I checked the time. I had 14 minutes spare so plenty of time for breakfast. Grabbed my presentation and dashed to the elevator. I had not – of course – counted on the elevator coming to a shuddering halt between floors 4 and 3. At first I just waited, these things can be temporary. But when that didn’t transpire I opened the small door with Emergency Phone written on it. A couple of wires dangled in there. No phone. Excellent. Still in apartheid so pre-mobile phones too. And there was nobody else in the lift to magically sort this out – or be a panicking nuisance so maybe that was just as well. What else? Force the doors open? I tried that but they only opened about a centimeter. Still it did feel a little better to be able to see a world beyond the elevator car. I could see the floor between the floors, the layers of substructure and carpet. Nobody out there though. I shouted a bit anyway just in case but nothing. After a while someone did come to take the elevator. I could see from their feet movements that they had pressed the call button. “Excuse me” I called out, “I’m in this lift and it’s stuck. Could you get someone to help?” The feet moved a bit, first in surprise, then in what looked like embarrassment, then they started backing away. The other elevator arrived and they got in it – despite my shouting. I checked my watch. My spare 14 minutes was now down to about 6. I started to get anxious about being late for this important presentation. Which in retrospect was probably better than focusing on my trapped state. Another pair of feet arrived and I went for a more focused attack. “Excuse me! Yes you, you in the brown loafers. I’m talking to you and I need you to help me. First I need you to go to reception and tell them the elevator is stuck and there’s someone in it. Then I need you to give them this note” I pushed a folded piece of paper through the gap in the door, hoping that the person would pick it up, and take it to reception, and they would look at it and act as instructed, so my colleague would at least know why I wasn’t there. Pity I was the only person with the presentation but there you go. Circumstances beyond my control. Thankfully this more specific approach did seem to work. A hand appeared by the feet and picked up the note. No speaking which is a shame – I could have done with a friendly “Don’t you worry we’ll get you out of there in a jiffy!” but this was better than nothing. Now I just had to wait and hope. And wait. In the end, about 40 minutes later I was released back into the world. It had all taken less than an hour but time passes in strange ways when you are stuck in a lift. Peter had got my note and the board were understanding about the delay. That week in South Africa felt like a test. Of my principles and of my resilience. I realized how much being in a stressed state (by the politics of the place) affected my normally laid back reactions to the surprises of travel. And that despite that, it was still perfectly possible to cope. Nothing terrible happened to me, just a couple of very minor operational hiccups. But the underlying sense of threat certainly changed their impact for me. And further increased my respect for those who go through major traumas and keep their head and heart in more or less the right place.